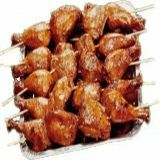 Chicken leg quarters marinated, skewered and grilled over hot coals and basted with a special basting sauce to give that sweet BBQ taste. Good for 10-12 person. Available in Metromanila only. Comes with Free greeting card!! �Philhearts never stock or mass prepare. All our foods are acquired only after your order is received. So each time you buy online with us, you get your food hot, off the chef�s kitchen. �Our cut off time is 10 Am Local. Orders received after cut off time will be processed on the following day. � Please Place your order at least 24 hours prior to intended delivery.